GeneAutry.com: Got a Gene Autry Question? Got a Gene Autry Question? Folks young and old are curious about America's Favorite Singing Cowboy and this is the place to find the answers to the frequently asked questions about Gene Autry. Many of the answers will direct you to a page on this website with additional information. If you don’t find your question listed below, then click on Champion, Jr.'s nose to email us. Please allow a week to ten days for a reply. Below you will find answers to the most Frequently Asked Questions about Gene Autry. Still looking for more or didn't find what you were looking for? Just ask Champion Jr.
Was Gene married, and did he have children? Is Alan Autry Gene's son? Gene Autry has all five stars on Hollywood's Walk of Fame. What are they and where are they located? When did Gene Autry die, and where is he buried? Is Gene Autry's recording of the children's Christmas song Poppy the Puppy on CD? Where can I buy the book Back in the Saddle Again? I have a Gene Autry record/poster/sheet music and want to know the value of it. Did any movie have both Gene Autry and Roy Rogers? How did Gene Autry, Oklahoma, get its name? Who was Gene Autry's Sidekick? How do I contact the Autry Museum of the American West's Museum Store? I want to visit the Autry Museum of the American West. When are they open? What does it cost? How do I get there? Why aren't the Flying A Pictures television series Range Rider, Annie Oakley, Buffalo Bill, Jr. and The Adventures of Champion on DVD or television? How tall was Gene Autry? What professional baseball team did Gene Autry own? What was the name of the Gene Autry's singing group? Did Gene Autry have any Native American heritage? 1. Was Gene married, and did he have children? 2. Is Alan Autry Gene's son? 3. Gene Autry has all five stars on Hollywood's Walk of Fame. What are they and where are they located? 4. When did Gene Autry die, and where is he buried? 5. Is Gene Autry's recording of the children's Christmas song Poppy The Puppy on CD? 6. Where can I buy the book Back In The Saddle Again? 7. I have a Gene Autry record/poster/sheet music and want to know the value of it. 8. Did any movie have both Gene Autry and Roy Rogers? 9. How did Gene Autry, Oklahoma, get its name? 10. Who was Gene Autry's Sidekick? 11. How do I contact the Autry Museum of the American West's Museum Store? 12. I want to visit the Autry Museum of the American West. When are they open? What does it cost? How do I get there? 13. Why aren't the Flying A Pictures television series Range Rider, Annie Oakley, Buffalo Bill, Jr. and The Adventures of Champion on DVD or television? 14. How tall was Gene Autry? 15. What professional baseball team did Gene Autry own? 16. What was the name of the Gene Autry's singing group? Before World War II, Gene Autry sang with a variety of singing groups in his movies, on his radio shows, and on record. After the war, the Cass County Boys were Gene's back up band in the movies and television shows, on radio, on record and at personal appearances. We currently do not have specific information on the Cass County Boys on the website. Information on them can be found in the books Public Cowboy No. 1: The Life and Times of Gene Autry and Gene Autry Westerns. 17. Did Gene Autry have any Native American heritage? Can't Find a Question? 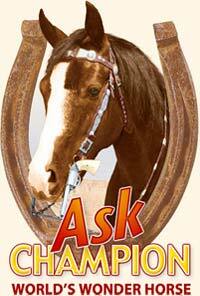 Ask Champion Jr. Please remember to provide as much information as possible when asking your question. The more details Champion Jr. has, the quicker he can reply.